I am pleased to announce our Customer of the Week! Erik and his son Soren. Erik and Soren live in Durham and enjoy baking Oatmeal Raisin Cookies and Brownies together at home. After they’ve cleaned up the kitchen they are fond of spending time at The North Carolina Museum of Life and Science, Durham Bulls games, and Soren’s favorite slide at Mt. Merrill. Soren’s favorite item at our stand is the blueberry muffin. I sent these gentlemen home with a loaf of our Chocolate Babka on the house. The sky threatened rain again this weekend, but we, luckily stayed cool and dry. The first hour of the day was slow, though refreshing. 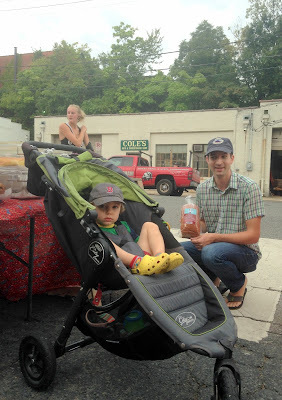 It gave us time to get organized and catch up with our market neighbors. Before heading down to the market I got to work alongside Joel this week for more donut training. Together we made Cocoa/Coconut, Curry, Cinnamon/Cardamon, Sugar and Old Fashioned Cake Style Donuts. Joel made the Brioche donuts; tossed them with sugar and filled them with Vietnamese Coffee Custard. The big hit of the week was our Round Challah. We had two varieties on hand, with and without raisins. Samples for tasting this week included: Vegan Cranberry Chocolate Chip Hand Pie, Double Chocolate Chip Walnut Cookie, Chocolate Chip Cookie and Vegan Gluten Free Pumpkin Bars. I’m looking forward to next Saturday. Weather Forecasters are promising a high of 87 with sunshine! Comment below if you know what “National Day” will be celebrated next Saturday, September 19th!